The Honest Kitchen dog food is a line of dehydrated, human grade pet foods that use all natural, whole food ingredients, according to the company. Unlike most pet foods, The Honest Kitchen sued the federal government over the right to use the term “human grade” for its foods and won in court. The company does not use chemicals, by-products or fillers in their foods. Who manufactures The Honest Kitchen? The Honest Kitchen was founded by Lucy and Charles Postins in a beach cottage in San Diego in 2002. It is now headquartered in the old Wonderbread Factory in San Diego’s East Village. The food is produced in an Illinois human-grade facility that makes cereals and other foods for human consumption. The company is family-owned with minority investors. The Honest Kitchen had a recall in February 2013 due to concerns about Salmonella affecting one of the ingredients used in some of their foods (parsley). They handled the recall in a very upfront and personal way with customers. This is the only recall we have found related to The Honest Kitchen. Embark, Force, Love, Preference, and Zeal are grain free. Primary meat protein sources include chicken, turkey, beef, and fish. 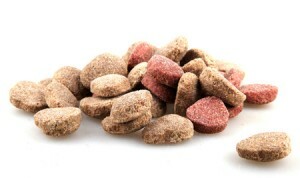 Preference is a premix or base mix food that you have to add meat to yourself to make your own dog food. It can be useful for owners who have dogs who might be allergic to some of the more common meat proteins found in other dog foods. Many of the formulas are also gluten free. According to the company they use free range chicken, cage free turkey, mid-western beef and 100% wild-caught fish. They also say that they use no ingredients from China. Some of the ingredients are organic. The foods are AAFCO approved (with the exception of Preference which is a premix and not intended to be fed without adding meat). The foods range from 21 percent crude protein to 36 percent. Fat ranges from 9 percent crude fat to 19 percent. Calories are mostly quite high – over 400 calories per cup of food, with a couple of foods over 500 calories per cup. The Honest Kitchen dog foods are dehydrated foods so they have to be fed to dogs a little differently than dry kibbles or other foods. It’s necessary to re-hydrate the food you are serving your dog with warm water for about five minutes before feeding him. For this reason, the food you buy in a package makes more food than you might expect. One cup of food from the package usually makes a pound of fresh food for your dog, for example. As you might guess, The Honest Kitchen dog foods are very expensive. You can buy trial sizes and smaller boxes of the food. According to The Honest Kitchen web site, a 10 lb box of Love dehydrated dog food is $99.99. A 10 lb box of Embark is $89.99. A 10 lb box of Thrive is $74.99. The Honest Kitchen dog foods look like outstanding foods if you are interested indehydrated raw pet food. They are very expensive and not in everyone’s budget, especially if you have multiple dogs or larger dogs to feed. On the other hand, many dog food owners are seriously concerned about the quality of their dogs’ food and want to make sure their pets are eating a human grade diet. If this is a priority for you and you like the ingredients in these foods, then you will probably like The Honest Kitchen. How would you rate The Honest Kitchen? According to The Honest Kitchen, Thrive is a gluten free dog food that’s made with free range chicken and organic quinoa (a seed, though people usually think of it as a grain), and sweet potatoes. It is AAFCO approved as an all life stage food for adults, puppies, and dogs who are pregnant and nursing. The company also says that it is suitable for dogs who need a performance dog food. Like other Honest Kitchen foods, it is dehydrated so it has to be re-hydrated with warm water before feeding to your dog. On a dry matter basis the food has 28.3 percent protein, 20.6 percent fat, 6.8 percent fiber, 42.4 percent carbohydrates, and 552 calories per cup of food. These figures are before the food is rehydrated. Hydrating the food cuts these figures roughly in half since you are adding water which dilutes the percentages. Although The Honest Kitchen describes Thrive as a “naturally low carb diet,” 42 percent carbs (dry matter basis) isn’t really that low, though it’s lower than some foods. They also suggest that this food is well-suited to dogs who need a limited ingredient food because it doesn’t contain fruit, eggs, beef, fish, white potatoes, flax, or alfalfa. It’s true that some of these ingredients are common allergens – eggs and beef, for example; and some dogs have digestive problems with potatoes, while flax can do weird things to a dog’s hormonal cycle. But Thrive isn’t exactly a traditional limited ingredient diet, though it does contain just a few ingredients (plus minerals). If your veterinarian recommends a limited ingredient diet for your dog, this probably isn’t what he or she has in mind since it’s made up of dehydrated raw food and most veterinarians look askance at raw diets of any kind, rightly or wrongly, because of the possibility of Salmonella and other bacteria. From a common sense perspective, most concerns about Salmonella and other bacteria are not for your dog but for you and anyone else in your home who may handle the food or come in contact with your dog if he’s carrying the germs. Dogs have enough strong stomach acid that eating food with a few germs won’t bother them in most cases – your dog eats garbage and dead things when he can and thinks they’re delicious. But dogs with a weakened immune system such as elderly dogs or very young puppies can be affected by these bacteria, too. Hence most vets are suspicious of raw dog foods. As we understand it, the fresh produce used by The Honest Kitchen is dehydrated below 104 degrees and is considered to be raw. Meat and fish used in their products are steamed between 140 and 165 degrees to kill food-borne pathogens. The meat and fish are then dehydrated at 125 degrees. Their grains and potatoes are flash heated at higher temps above 210 to make them more digestible and break down cellulose. It sounds like the biggest danger here, in terms of germs, would come from the fresh produce and, indeed, when The Honest Kitchen had a recall it was due to concerns about Salmonella affecting parsley in some of their foods. The first five ingredients in Thrive are Chicken, organic quinoa, sweet potatoes, spinach, and parsley. Chicken is an excellent source of protein for dogs. It’s made up of about 80 percent protein and 20 percent fat. It supplies vitamin B6 and phosphorus, and it’s a very good source of niacin and selenium. Quinoa is 15 percent protein, 14 percent fat, and 71 percent protein. That’s a high percentage of protein for a seed. It’s a good source of magnesium and phosphorus, and a very good source of manganese. It’s used here instead of some of the more common grains you see in kibbles. It’s very nutritious. Sweet potatoes have become very popular in dog foods, especially grain free foods. They are high in carbs – 93 percent, with 6 percent protein and 1 percent fat. But sweet potatoes are a good source of dietary fiber, vitamin B6 and potassium, and a very good source of vitamin A, vitamin C and manganese. The fourth and fifth ingredients here – spinach and parsley – provide lots of vitamins and minerals. Spinach is 30 percent protein, 56 percent carbs, and 14 percent fat, which is a remarkable profile for a vegetable. It’s a good source of niacin and zinc, and a very good source of dietary fiber, vitamin A, vitamin C, vitamin E (Alpha Tocopherol), vitamin K, thiamin, riboflavin, vitamin B6, folate, calcium, iron, magnesium, phosphorus, potassium, copper and manganese. There are good reasons why people tell you to eat your spinach! Too much spinach (and some other foods) can cause dogs to form calcium oxalate stones in their kidneys or bladder but there’s no reason to think that The Honest Kitchen uses too much spinach in their foods. Parsley is another good source of vitamins and minerals. It’s 20 percent protein, 18 percent fat, and 62 percent carbohydrates. It’s a good source of vitamin E (Alpha Tocopherol), thiamin, riboflavin, niacin, vitamin B6, pantothenic acid, phosphorus and zinc, and a very good source of dietary fiber, vitamin A, vitamin C, vitamin K, folate, calcium, iron, magnesium, potassium, copper and manganese. Otherwise, Thrive has some organic kelp which is a good source of trace minerals and chelated minerals in the food. 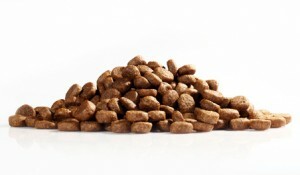 Chelated minerals (proteinated minerals) are easier for dogs to digest and usually found in better dog foods because they are more expensive for companies to buy. And that’s it. That’s the entire ingredient list. If you prefer dog foods that don’t have a lot of extra strange things in them or long ingredient lists, then you have to like this food. From what we can tell about Thrive, the ingredients look very good and so does the guaranteed analysis. This looks like a food we would recommend if you like a raw dehydrated food. It is an expensive food so you’ll have to look at your bank balance to see if this is something you want to buy. Where can you buy The Honest Kitchen dog food? You can buy The Honest Kitchen pet food from Petfooddirect.com, Amazon.com and other online pet food retailers. You can also buy it from many specialty pet food stores. The Honest Kitchen also has a page so you can find retailers near you. Since my dog has been eating RAW food and I won’t prefer for it to have COOKED foods again. I am interested in trying Honest Kitchen but needs to be 100% sure that it is DEHYDRATED RAW PET FOODS. Honest Kitchen does have a problem with saying raw but not really being raw. The meats are cooked. The veggies, etc. are not. We’ve been using Thrive for about two months. I have a dog with a sensitive stomach and she’s had no issues with this food. She also LOVES the taste – really, she goes crazy for this. The rehydration is very easy and I’d say the food is actually ready in 45 seconds, not 5 min as mentioned in the article. We’ve used chicken and turkey flavors. Both equally well liked and handled by our dog. My American bulldog had problems with ears, skin. Since using Honest Kitchen, she has not had a problem ..no more trips to the vet re these issues! She lost 25 pounds, has more energy than a puppy. I couldn’t be happier. She has tried all the flavors and loves them all. My only complaint is: it is hard to get in local pet stores, which makes it very inconvenient. Had my dogs on Honest Kitchen for over a year. I had to feed them a LOT to keep weight on them and they are not active dogs lol. They also developed very dry, dull coats after a few months. I do think this is good food, at least I like the idea behind it, but my dogs just weren’t getting what they needed apparently so I switched them back to high quality kibble (Acana) with canned as a topper. Now they have beautiful, soft, shiny coats again and look great. I don’t know if there just aren’t enough fats and oils in the dehydrated food or what the issue is but I wouldn’t feed it alone again, only as part of the diet perhaps. I use Honest Kitchen Preference because I like adding my own meat. Chicken is known to cause allergies so I avoid using it and mostly use turkey, beef and pork. I make a meatloaf for my 2 dogs (a Rottweiler and a Cavalier King Charles) and have been cooking for them for about 1 year. They are healthier for it and have no allergies whatsoever. I add supplements for my Rottweiler because she is 7 years old now and has a little arthritis, which is greatly improved. I will continue to use Honest Kitchen because the ingredients are pure and fresh. I love it! I get it on Amazon and it is much less expensive that way. I have a small breed dog, about 8 lbs. She loves the taste of honest kitchen! She’s had grain and grain fee HK before, chicken, turkey, and beef. My dog was getting a bit over weight and I found the brand she was eating before was not good quality so I switched to Honest Kitchen. Like another review listed, after a few months she lost a LOT of weight, became very skinny (she’s not very active), and her poop was very large from the first bowl of HK. Plus she had difficulty pooping, it took a long time.I don’t think she absorbed the nutrients very well. I switched to Orijen about a year ago. Literally the only hard dog food I’ve ever gotten her to eat. It’s good quality, and a lot cheaper than HK. I’m happy and she’s happy. She’s also a nice stable healthy weight now.